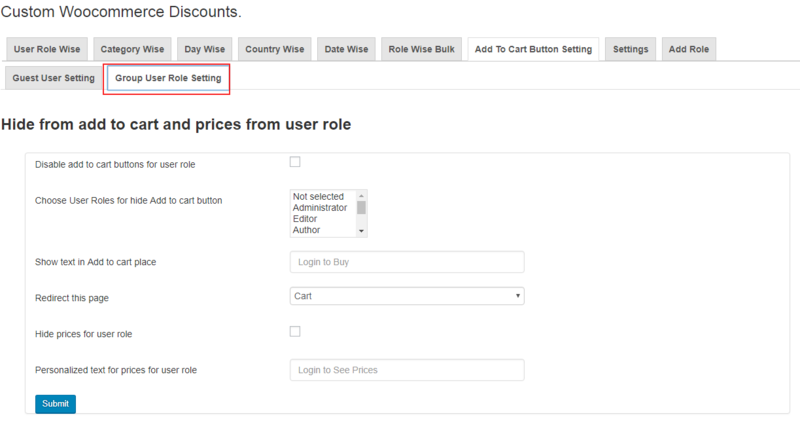 Custom Woocommerce Discounts allows you to set a discount by USER ROLE, by CATEGORIES, by DAYS and by COUNTRIES to the products. The plugin provides a flexible discount method and options to apply discounts on products. It also offers well-defined solutions to help you set the discount rules for your store. Now easily manage your WooCommerce Different User Roles By Applying Them Different Pricing & Discount. Role-based pricing and Discounts for products. You can charge wholesalers and retail customers with different prices or set discounts for the particular role group. Allows to create Custom Roles with Acess Permission. It allows to create custom roles like admin, customer, subscriber, wholesaler etc. and granting these roles with certain permissions respectively. Ability to set discount to a variable as well as a simple product. Each product having different variables, where different discounts can be applied to each variable of a product. Easily apply discounts for different Categories of products. For example, discount percentage or discount amount can be set as per available categories ex- T-shirts, tops, jeans etc which comes under clothing categories. Plan your SALE on your store well ahead by setting discounts for particular Days. For example, Black Friday Sale, Christmas Sale, Independence Days SALE etc. can be held be setting Date. Special Prices/Discounts will be applied for only on selected Day. Different discounts can be applied to the same product based on country of the user. You can select discounts by a percentage or amount method. Allows Discounts on Regular price or Sale price. Compatible with Ultimate Members, User Role Editor.